BUFFALO, N.Y. -- While enlisted in the Air Force, Lucas Purser was diagnosed with cancer in his right arm. After several surgeries, he underwent a four-quarter arm amputation. Despite this challenge, Purser was motivated to achieve both his short- and long-term goals. Purser’s short-term goal is to remain in the same physical shape as he was while on active duty. “The motto for my life right now is to 'adapt and overcome.' If I face a problem, I don’t stop until it’s resolved,” Purser said. Purser became determined to reach his short-term goal by participating in the 2016 Department of Defense (DoD) Warrior Games. Three hundred wounded, ill, and injured service members and veterans gather annually to participate in the Warrior Games. The athletes represent the United States Army, Marine Corps, Navy, and Air Force. Purser represented the Air Force as he competed in sitting volleyball, swimming, field, and shooting. He ended up taking home a silver medal for discus throw and a gold medal in sitting volleyball. 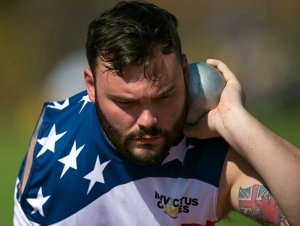 He also took part in the Invictus Games in Toronto in 2017. With the support of his family, Purser continues to train while striving to achieve his long-term goal of obtaining his bachelor’s degree in computer information systems (CIS). “I came to Buffalo State for the student-teacher ratio, and people had told me good things about the college,” Purser said. Now a junior, Purser has maintained dean’s list status throughout his undergrad career. He uses the leadership skills he has gained through his life experience as a teacher’s assistant (TA) at Buffalo State. Purser encourages students to not be discouraged by their setbacks and motivates them to aim for the goal they have set for the class. He says that being a TA has been very rewarding because it allows him to help students reach their goals. “The leadership role is great, and I’ve gained a deeper knowledge of my major,” Purser said. Living by his motto “adapt and overcome,” Purser continues to set new goals for himself. He is training and hopes to participate in the 2020 Tokyo Paralympic games.